1) How to clean it? 3) Is it easy to clean, if not how difficult? Update: I also have a normal gravel cleaner with a pump I don't now if that will make a difference. Best Answer: Just my two cents here, but if you have cichlids that move the substrate around, what makes you think they won't move the sand as well? And if they pick up a mouthful and spit it in the direction of your filter intake, sand going through the intake will shorten the life of your filter as it scratches into the magnet of your impeller. Now that I've given you the worst-case scenario, there are ways you can make this work. 1) Cleaning can still be done with a gravel vac, only you don't dig down into the sand. Start with the vac about 1/2 inch above the sand, and move it a little closer if needed to pick up what you need to get out. If you start to pull up sand, quickly bending the hose will cut the flow and let any and in the tube fall back into the tank. Use a bucket for water coming out of the tank, then you can pour off any water and put any sand that makes it that far back into the tank. Better than it going into your sink darin and causing a clog. You can use a stick or plastic fork to stir up the sand a little if necessary although your eels/loaches will help with that too. 2) Are the cichlids African Rift Lake (higher pH) or otherwise? If they're African Rift Lake, a cichlid sand or marine sand would be best for them, these are made of calcium carbonate and will help keep the pH and hardness up for the fish. If they're Central or South Americans, or Africans that don't need a higher pH, you can use normal sand. I use finishing sand for making paved walkways. This is the stuff you put over the top of the pavers. It's coarser (larger) than play sand, so it's a little heavier for the fish to spit up higher in the tank. This may help keep some of it from reaching a filter intake. It's also a variety of sizes, so it looks more like natural substrate. It's also a lot cheaper for the amount you get. But not much in the way of color varieties, only the natural variety of the rock it came from (brown, tan, and reddish brown with an occasional piece of white). 3) I don't think it's any harder than gravel, just different since you don't dig down into it. Once you get the hang of how close you can get before the sand starts getting picked up and how to stop the flow if you start pulling it up there's not much to it. 4) It's better for plants (not an issue for you if you have digging cichlids and crayfish) and fish that like to burrow because it's closer to their natural environment. You just want to stay away from any that has sharp edges. Imagine being a loach or eel (scaleless) and wiggling your body through pieces of sharp glass. 5) It's mostly a balance of what's best for your fish and what you like/works best for you. I've given some pros and cons above both for you and your livestock. Your cichlids and crayfish will still move the sand around, that could wreak havoc on your filter. You can position the intake as high up in the tank as is possible. You can also put a sponge prefilter over the intake or use a piece of pantyhose to keep all but the smallest of particles out. Or, go entirely to a sponge filter http://images.search.yahoo.com/search/im... which is driven by an air pump and has no moving parts, but these take up space in your tank and aren't the most attractive thing to look at. . Cleaning takes a little while to get used to. It's safer for some fish (as opposed to gravel) if they should swallow it - sand is smaller and if any was to be swallowed by one of your fish, it could pass through their intestines without causing an impaction. But in the end, only you can decide if it's worth it to you (and your fish) to make the change. I use play sand in my tanks. The plants do fantastically well. You just have to rise the sand about 20 times before you put it in your tank. Once it has been in there about a week, the sand is well settled, and you can vacuum over it no problem. (waste and debris are sucked up, sand doesn't move). Costs about $5-8 for 50 lbs, more than enough for your tank (I used a 50lb bag for my 38 and 10 gallons, still have lots left over). My fish and plants do well with it. However if you have fragile eels (not sure what types of eels you can keep in such a small tank, unless you mean loaches) I would go with pool filter sand. I have used aquarium sand before. The only problem is during water changes or when tending to your plants. All the tank water gets blanketed with sand and it takes about a day to resettle. 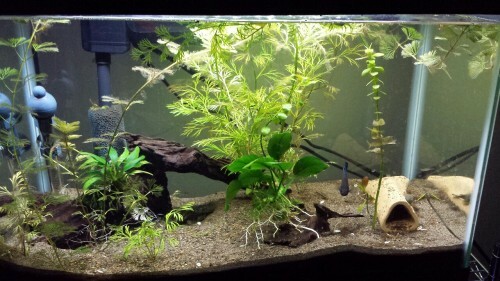 Sand question for a freshwater fish tank? Salt water fish tank sand snail question? Fish tank question. Is sand or gravel best for the bottom of my tank? Questions about sand in fish tank?